Suddenly I'm feeling awfully nostalgic too. Thank you. You are very welcome. 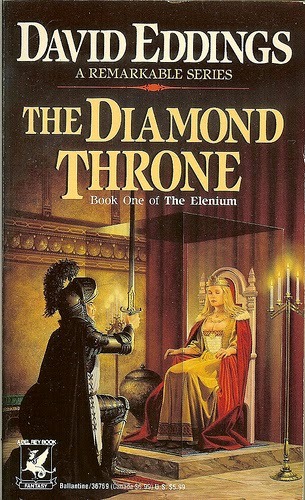 Also, I just reserved The Diamond Throne from my local library. Because nostalgia. I feel the exactly the same way. 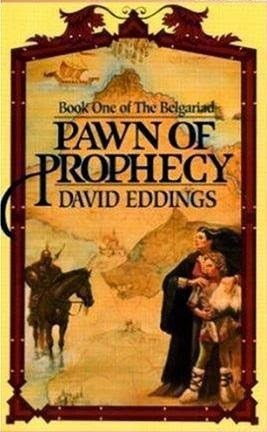 Eddings was my gateway fantasy author. Without him I would never discovered Tad Williams, Raymond a Feist, Robert Jordan which led me to GRRM and A Song of Ice and Fire. I still have his original paperbacks that I have since I was a teenager! Years ago I almost bought the omnibus sets of his stuff, but I have such a fondness for those little paperbacks. I can just picture them on my shelf. I more than wore them out as a teenager. Piers Anthony may have been my introduction to fantasy, but Eddings was definitely the gateway. Ah, I remember those two series fondly, but I don't think I'd revisit them now. I never read the Elenium, though. (checking) Hmm, there's a 3-book series that follows it, the Tamuli--ever read that? I'm suspicious of this pattern (is this another "same exact story" situation, as with the Mallorean?). I don't recall the Tamuli being a repeat of the Elenium like the Mallorean is, but it's been a while. I have first book of the Elenium from the library, so we'll see how well it holds up to my memory / my changing taste.